Place risen dough on countertop and, using a rolling pin, roll into a very, very thin square (about as thin as the walls of a ravioli). Using a pizza cutter, cut square into strips lengthwise and then cut crosswise so you have about 56 individual 1 1/2-inch squares (or as many as you end up making). Put about 1/2 tsp pizza sauce on half the squares, and top with the same amount of cheese. Take the plain squares and place them on top of the squares with sauce and cheese and pinch the seams closed. Press fork tines around the edges of the squares to close the seams completely. Place each pocket on a baking stone or parchment paper-lined baking sheet and bake for about 10-15 minutes or until lightly brown on the edges. Serve immediately. If there’s anything my husband loves (second to me, of course), it’s Totino’s Pizza Rolls. He could eat them for breakfast, lunch, dinner and dessert every single day. I’m really not exaggerating! Though they are quite delicious, easy to make and don’t cost very much, sometimes—due to the demand of his growling belly—we run out. And when the football game is on in 20 minutes, well, there isn’t time to go buy more. That’s where I come in. I decided to make Homemade Pizza Rolls on one such occasion. Mine can barely compare to Totino’s, really. 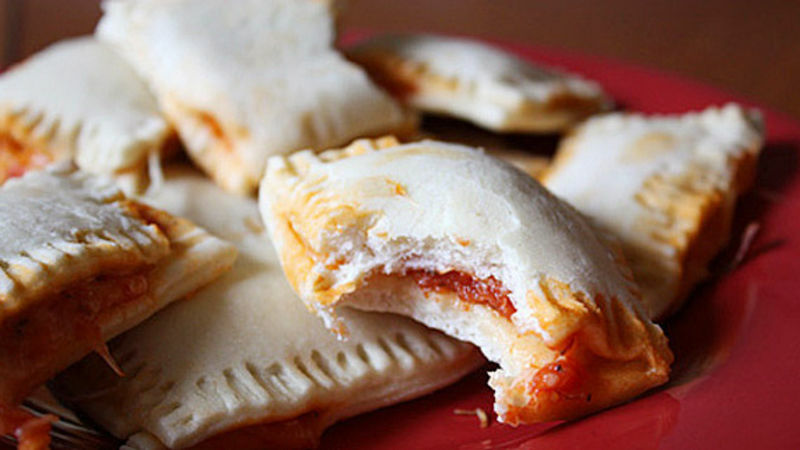 They’re more like pizza pillows, with less filling but with a thicker, softer crust. Still, they taste like mini bites of pizza and that’s really what we’re going for here. What’s great about this recipe is how fun it is to make! I love rolling out the dough, slicing it into tiny squares, covering them in tangy pizza sauce and mild mozzarella cheese, and sealing them closed into ravioli-like shapes. And they’re just so cute coming out of the oven, all warm and cheesy and bite-sized. As you may know from a previous post, I have a soft spot for miniature things. Don’t judge. Next time you find yourself craving a big batch of pizza rolls but don’t have any in your freezer, whip up this delicious recipe and save yourself time, energy and gasoline!